Dogs are a man's best friend. And woman's too! So how do we keep our best friend happy and healthy? One solution is to take great care in their diet. I usually recommend making your own dog food, then supplementing with, good quality, store bought foods. 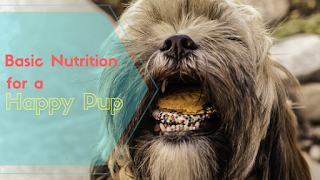 However, even if you just use store bought food, learning the basics of your pooch's nutritional needs can help you help them live a long, happy and healthy life. To start, here's a basic introduction to nutrition for dogs. Though most commercial dog food is largely made up of carbohydrates, dogs don't really need to consume carbohydrates for energy, they get that from protein and fats. However, whole grains provide more than empty carbs. They can provide essential vitamins and minerals as well as fiber. Carbohydrates also come from fruits and vegetables which offer many more nutrients as well. When you're buying dog food, make sure that the listed ingredients are whole foods. Ingredients are listed in order of quantity, largest amount to least amount. Check to make sure the meats are listed first. Try to find food that lists a specific type(s) of meat and not a generic “meat” meal. Aim for products that use natural preservatives such as tocopherols (Vitamin E) and Vitamin C. Natural antioxidants (rosemary extract) can also be used as preservatives. Avoid by-products (meat or otherwise), sweeteners, artificial colors, artificial flavors, and artificial preservatives. If you decide to make your own dog food, there are a few other things to keep in mind. First, raw food is a great thing to add in to your dog's diet. The canine digestive track is naturally able to fight most food-born illnesses off. However, dogs are one of the more domesticated animals in the world and sometimes need a little extra help. I recommend making a dog food of 70% cooked and 30% raw for maximum nutrient absorption. What works best for my home is spending one day a week cooking a little extra food for the pup and keeping that refrigerated. I also take some time, that same day, to mix up a bit of raw food, pre-portion it out, and freeze the portions. When I go to bed at night, I pull out one portion and place it in the fridge for the pup's breakfast. I mix the raw and the cooked together each meal. I also sprinkle in some tasty, nutritious herbs, such as nettle or turmeric. These herbs help increase vitamin and mineral intake as well as add to the flavor of the meal. A quick internet search can help you find several recipes to try. Having several good recipes on hand is a good way to make sure your furry friend gets all the best nutrition possible. I hope this entry has helped introduce you to a good bit of the basics of canine nutrition. If you have any questions or comments, please leave them below! Dr. Kidd's Guide to Herbal Dog Care by Randy Kidd, D.V.M., Ph.D.